Contemporary blind-stamped calf over wooden boards; vol. 1 in dark calf with scattered tools including a circular 'his' tool; vol. 2 in lighter calf with simple interlocking fillets at covers; both rebacked, preserving original spines. 2 vols; vol. 1, 368 leaves (of 370), without preliminary and final blank; vol. 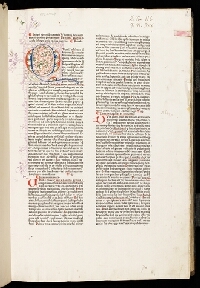 2, 327 leaves (of 328), without final blank; unfoliated and unsigned; spaces for initial capitals; 12-line initials supplied in red and blue; initials at text openings in both volumes illuminated in red and blue with floral decoration extending into the margins. 1. Herschel V. Jones. 2. Eric Sexton (bookplate), Christie's 1981, lot 165. COPYRIGHT (C) KEIO UNIVERSITY ALL RIGHTS RESERVED.